East African Community Adopts Its Energy Security Agenda. What's Not Boring About Infrastructure and Integration? President Yoweri Museveni (in hat), the Omukama of Bunyoro Solomon Gafabusa Iguru, left, and the Tanzanian foreign affairs minister Dr Augustine Mahiga, right, commission the oil pipeline. Kampala — If holding hands, beaming smiles, and signing piles of Memoranda of Understanding (MoUs) is a measure, then Tanzanian President John Pombe Magufuli's visit to Uganda from Nov.9 - 11 was a total success. The brotherly romance between the 58-year old Magufuli and his host, 73-year old Yoweri Museveni was encouraging to observe. It was even more significant following years of less-enthusiastic leadership on regional issues from Tanzania under Magufuli's predecessor, Jakaya Mrisho Kikwete. The result has been an adverse trade balance for Uganda. For instance, in 2017 Uganda has so far imported 191 million tons of goods from Tanzania valued at Shs617 billion. On the other hand Tanzania has imported only 52 million tons of goods valued at Shs251 billion. Magufuli's visit coincided almost exactly with the end of his second year in office. He was sworn in on November 05, 2015. His host, President Yoweri Museveni, has meanwhile been president in office for 31years - since 1986. So, as Magufuli enthusiastically strolled from one agreement signing to another ground-breaking ceremony with the energy of a new manager, Museveni's rather lethargic gait of a long-service leader who has seen this before was unmistakable. The contrast has since led some pundits to claim that the activity during the visit was a mere ritual and political posturing for one leader and serious business for the other. Fred Mukasa Mbidde, an elected member of the 3rd East African Legislative Assembly (EALA) belongs to the skeptical crowd. "Presidents visit each other and posture as being serious but end up not implementing what they discuss," he told The Independent on Nov.10. To him Magufuli's visit to Uganda was just like any other ordinary activity aimed at boosting bi-lateral relationships of the two Presidents "that won't yield much results". But many say something tangible could be happening in the East African region coming from Tanzania under Magufuli. Isaac Shinyekwa, the renowned research fellow and commentator on trade and regional integration issues from the Economic Policy Research Centre (EPRC) at Makerere University in Kampala says Magufuli's visit presents an opportunity for Uganda and the EAC integration process. He said, however, that Magufuli's visit also "provides space for the two presidents to remind themselves about unfulfilled promises and find ways of delivering on them". "Magufuli is a serious leader and his visit means he supports the EAC integration process," Shinyekwa says, "We should not read the initiatives being launched by the heads of state as rituals. "The Presidents are serious; they want to do business." On the face of it, Shinyekwa is right because the presidents signed various protocols and launched numerous processes related to bilateral cooperation on energy, transport, tourism, trade and investment, infrastructure, and security. Protocols were signed on Trade promotion and reduction of non-tariff barriers, infrastructure development on roads, railways, waterways, and oil, and cross-border energy and electrification projects. But Mbidde says instead of rushing to sign protocols, the presidents need to first settle internal political differences within their countries to ensure that regional projects being commissioned and planned under the EAC integration arrangement succeed. Mbidde says, for Uganda, the current controversial move to amend Article 102b of the Constitution to extend Museveni's rule is causing political uncertainty and is negatively impacting on the economy. He said Uganda could join Burundi, South Sudan, and Kenya which are politically divided and prospects for peace are in doubt. For Kenya, Mbidde says, President elect, Uhuru Kenyata, will not find it easy to implement economic projects amidst claims by a powerful opposition that he was illegitimately elected. This is in addition to the economic war the opposition has called for. As the debate over the usefulness of the Magufuli visit rages, there are people; especially traders, who have more practical concerns. Issa Sekito, the spokesperson of Kampala City Traders Association (KACITA) says although the two presidents spoke of easing trade between the two countries, trade barriers remain the at border. Sekito says even as Magufuli visited, 25 traders had reported to his office that Tanzania customs authorities at Mutukula border were holding their goods over what he called "simple quality issues". Sekito wants the provisions of the EAC Customs Union to be implemented, especially total removal of charge of import duty on goods made in East Africa using local raw materials. "What the Presidents launch should tally with what they are implementing," he says. Generally, going by the discussions and by implementing the resolutions that came up from the meetings of the two heads of state and their junior officials, Magufuli's visit could promote trade, create jobs, and strengthen the economies. Museveni and Magufuli's main event was laying of a Cross-Border mark stone at Ruzinga village in Kyotera District as part of the implementation of the East African Crude Oil Pipeline (EACOP) project on Nov.09. The 1,444km buried pipeline will run from Hoima in western Uganda to Tanzania's Tanga port on the Indian Ocean. Its Inter-Governmental Agreement has been ratified by both countries and that the Front End Engineering Design Study completed. The heads of state directed their respective ministers to complete the remaining processes so that construction of the pipeline begins in 2018 and is completed by 2020. 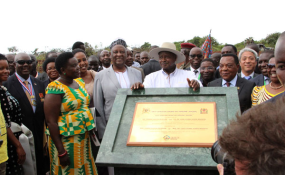 The two Presidents also officially opened the Shs90 billion, One Stop Border Post (OSBP) at Mutukula - the border between Uganda and Tanzania. This facility is designed to ease movement of persons and goods across the common border and contribute towards strengthening the East African Community integration and boost trade. Construction of the US$30 million OSBP was funded by TradeMark East Africa (TMEA) and the TMEA Chief Executive Officer, Frank Matsaert, says it is designed to be "a transformative initiative aimed at growing trade and boosting prosperity in East Africa". Regional trade experts like Shinyekwa agree that the OSBP complements other regional initiatives like the Electronic Cargo Tracking System and the Single Customs Territory, which are instrumental in eliminating trade barriers and spur economic growth. Doris Akol, the commissioner general at Uganda Revenue Authority (URA) says the OSBP means URA and other government agencies - Uganda National Bureau of Standards, Immigration, National Drug Authority - can now work alongside their counterparts from Tanzania to clear goods at once. She said clearing goods that used to take three days now takes less than a day. She says Mutukula border is seeing increased volumes of trade. She says imports to Uganda from Tanzania via Mutukula border have increased by 185% - from 143 million tons in 2012 to 191 million tons in 2017, valued at Shs 215 billion in 2012 and Shs617 billion in 2017. Exports from Uganda to Tanzania via Mutukula have also increased by 211% - from 28 million tons in 2012 to 52 million tons in 2017, amounting to Shs 81billion and Shs 251billion in 2012 and 2017 respectively. Annually, Mutukula border clears about 9895 trucks carrying goods and 1500 buses that mainly transport people. She says business would be better if the border had banks and reliable power supply. The two Presidents witnessed the signing of a memorandum of understanding (MoU) for cooperation between Tanzania Broadcasting Corporation (TBC) and Uganda Broadcasting Corporation (UBC) as well as a MoU between the Uganda Police Force (UPF) and the Tanzania Police Force (TPF) on security matters. The Presidents discussed the ongoing cooperation between the two countries on oil exploration in Tanzania and directed their respective ministers and the technical teams to continue the exploration work being undertaken. They also exchanged views on the proposal to develop a gas pipeline between Tanzania and Uganda and directed their respective ministers to undertake the necessary preparatory work. Regarding cross-border energy projects, the Presidents took note of the commencement of works on the Kikagati/Murongo hydro power project. They directed the respective ministers to ensure that the project is completed on time. They also directed that implementation of the Nangoma cross-border electrification project and the Nsongezi hydro power 35 MW project be expedited to ease power problems and improve livelihoods of the citizens. In addition, they asked the ministers to fast-track the implementation of the MoU's the two countries signed earlier in July 2017 to improve ports, inland waterways and railway services. They also directed that the new regional projects namely Kasulo - Kiake - Masaka road and Omukakorongo - Mugati - Mbarara be prioritized to ease access to the port of Dar-es-Salaam. They also directed the respective ministers to expedite the joint verification exercise to establish validity of citizenship claims after the border reaffirmation exercise of 2003. They further directed that the boundary reaffirmation exercise should be undertaken and completed as agreed upon. On the Economic Partnership Agreement (EPA) between the East African Community and the European Union, the two heads of State noted that as mandated by the EAC summit, President Museveni led an EAC delegation and met the President of the European Union (EU) Commission in September 2017. They said that a response to the issues raised is being awaited from the EU. The two presidents exchanged views on the ongoing inter-Burundi dialogue and reiterated their call to all parties to take part in an all-inclusive dialogue in order to find a durable solution to the crisis in Burundi. Copyright © 2017 The Independent. All rights reserved. Distributed by AllAfrica Global Media (allAfrica.com). To contact the copyright holder directly for corrections — or for permission to republish or make other authorized use of this material, click here.